As a foreign assignee, you can expect a flexible lifestyle in Hanoi. You can either live simply like most locals or enjoy all the luxuries you can afford. Most residents travel with a motorbike, and most foreigners staying in the country for years also find it as a convenient mode of transportation. All driver, however, are warned of the high risk of traffic accidents (don’t forget your insurance!). Most foreign assignees in Hanoi choose to rent furnished apartments in districts formerly held by the French. These neighbourhoods are accessible from international schools, establishments and business areas. Most expats living in Hanoi drive around the capital with an electric bike. You can buy your own, but if you’re staying in the country for only a few months, you can opt to rent a 125cc motorbike for US$40 per month. Fuel is around US$15 per week. 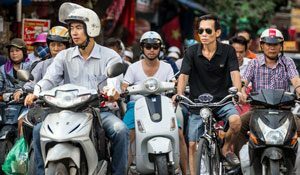 Whether you’re driving a car or a motorbike in Hanoi, take extra caution as road accidents are the single greatest health and safety risk you’d face during your stay. More than 30 people pass away each day due to collisions and other transportation-related incidents. The law strictly enforces the use of motorcycle helmets. Choose one with the highest quality you can find. A valid International Driver’s License or any valid driving permit issued in the country of origin. You’d need to have your existing license translated into Vietnamese. If you hold a valid International Driver’s License or a similar permit from your home country, you don’t need to undergo testing anymore. Take note that your Vietnam-issued driver’s license expires with your international/national license except for a motorcycle-only driver’s license which doesn’t expire. If driving is not your thing, you have a wide range of options for public transportation. A taxi ride around Hanoi will only cost you US$2-3 per trip. For an eco-friendly commute, you can go for an electric bus. This train travels within a network of 14 stops in the Old Quarter and around Hoan Kiem Lake. Walking around Hanoi is the best way to know the city. But if you’re in a hurry, you can hail a “xe om” (motorbike taxi) anywhere. An average journey in the capital costs less than a dollar per passenger. If you’re travelling in groups, opt for a cheaper metered taxi instead. The Vietnamese tuk-tuks, or the cyclos, can still be found in major cities. You can find several of them in the Old Quarter. A ride can cost US$2-3, but be on the lookout for overcharging cyclo drivers. Agree on a price first before riding in. The top companies, commercial developments and schools, as well as the telecom infrastructure, utilities and other basic services are well-established in Hanoi. It’s not uncommon to find colonial neighbourhoods with Western influence, evident from the likes of grand villas with French-inspired architecture, manicured gardens and palm trees adorning the streets. There are also plenty of serviced apartments, studio flats and other types of modern accommodations for expat workers, families, students or retirees. The Hoan Kiem District, also known as the Old Quarter, is one of the most prominent expat neighbourhoods in Hanoi. It is regarded as the capital’s business and tourism hub. The district lies near Hoan Kiem Lake and surrounded with Western-style buildings, French villas, Buddhist temples and pagodas. A stroll along the Old Quarter is like a journey into Vietnam’s rich oriental culture, deep religious and Western influence. There’s a long line of cafes, French bakeries, boutiques and restaurants around the neighbourhood. The Old Quarter is also a preferred residential location for foreign residents. The Ba Dinh District or the French Quarter is the centre of governance in Vietnam. Government offices, embassies and consulates and elegant villas are found in this district. The Ba Dinh Square, located that the heart of the French Quarter, is home to the majestic Presidential Palace. You can also find the One Pillar Pagoda and the Hanoi Flag Tower around the square. Along Trang Tien road, you’d find a shopping area where cafes and restaurants, retail shops, bookstores and galleries are located. Walk for a couple of minutes and you’d see Cho 19-12 Market where you can buy fresh fruits and vegetables, seafood and meat. The West District or Tay Ho, located at northern part of Hanoi, is a high-end residential neighbourhood where a large population of expat live. The former sleepy fishing area is now a top tourist destination in the capital. You can find chic boutiques, restaurants and bistros along this beautiful lake district. The West Lake District is also an emerging artistic and cultural centre. You can find galleries full of European art pieces, shops for embroidered silks, and lakeside stores of traditional Vietnamese jewellery and clothing. Vietnam is a haven for real estate investments as properties are generally cheaper in the country than in other parts of the region and rental yields have been showing strength over the past years. Effective July 1, 2015, foreigners with valid residence visas may purchase up to 30% of a condo or up to 250 houses in an administrative area with a 50-year lease. Foreign owners also rent out these properties provided that notify their local housing authorities. If you’re in the market for a housing unit, be reminded that you’re limited to own up to 30 per cent of the total number of units in a residential building. This is applicable to condominiums. You’re also limited to buy a maximum of 250 houses in an administrative unit. Home ownership of foreigners is up to 50 years, though you can apply for an extension. Renting is a popular housing option among expats. A one-bedroom semi-furnished apartment in the French Quarter District can be leased for US$600-700 per month. A fully-furnished studio flat in Tay Ho is available for US$500 per month while a fully-furnished villa in the Old Quarter District can be rented for US$1,500-2,000 per month. Check out real estate listings in major expat neighbourhoods in Hanoi. The education system in Vietnam is divided into four levels: the preschool and kindergarten (ages 3-6), the primary school (ages 6-11), the secondary school (ages 11-18), and the college/university years. The only compulsory level is primary school. Secondary school is divided into two levels: lower secondary or trung học cơ sở (ages 11-15) and higher secondary or trung học phổ thông (ages 15-18). High school students under entrance and exit examinations. Prior their admission to higher secondary school, they’d have to choose between natural and social sciences as the focus of their studies. Foreign language (English, Chinese or French) is an important part of the secondary curriculum. There are senior colleges, research institutes and universities all over Vietnam. After high school, students can also go for junior colleges or vocational schools. Most of the top institutions are in Hanoi. VNU, one of the two national universities in Vietnam, is the first modern university in the country. It was established in 1945; the University of Indochina was founded in 1906. VNU is also the country’s premiere research centre. HUST is Vietnam’s top national centre for scientific and technological research. It offers undergraduate courses in electrical engineering, applied mathematics and informatics, textile, materials science, etc. HNUE runs the Institute for Educational Studies and the Institute of Social Sciences. It offers 41 training programs at the undergraduate level, 41 masters programs and 41 doctoral programs. HNUE partners with other tertiary institutions in Australia, Belgium, the Netherlands and 30 other countries worldwide. FTU was established in 1960 to be a leading teaching institution in finance, management and marketing. It has a large population of foreign students from East Asia, Europe and North America. FTU has specialised training departments teaching Chinese, French, Japanese and Russian. RMIT Vietnam, established in 2000, is an international branch of RMIT University in Melbourne, Australia. Its campus in Hanoi has about 1,400 local and foreign students studying accountancy, commerce, English, IT, and professional communication. It also has a campus in Ho Chi Minh City with more than 600 students.